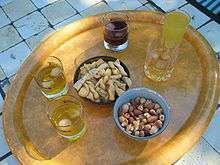 Apéritifs and digestifs (/əˈpɛrᵻtiːf/ and /diːʒɛˈstiːf/) are drinks, typically alcoholic, that are normally served before (apéritif) or after (digestif) a meal. An apéritif is an alcoholic beverage usually served before a meal to stimulate the appetite, and is therefore usually dry rather than sweet. Common choices for an apéritif are vermouth; champagne; pastis; gin; rakı; fino, amontillado or other styles of dry sherry (but not usually cream sherry, which is very sweet and rich); and any still, dry, light white wine. "Apéritif" may also refer to a snack that precedes a meal. This includes an amuse-bouche, such as crackers, cheese, pâté or olives. "Apéritif" is a French word derived from the Latin verb aperire, which means "to open." The French slang word for "apéritif" is "apéro," although in France an "apéro" is also food eaten in the late afternoon/early evening. St. Diadochos of Photiki, in his writing on the Christian spiritual life, On Spiritual Knowledge, states, "People who wish to discipline the sexual organs should avoid drinking those artificial concoctions which are called 'aperitifs'—presumably because they open a way to the stomach for the vast meal which is to follow." Diadochos was born around 400 A.D. and died sometime before 486 A.D. He was from Northern Greece and was a significant theologian during the Council of Chalcedon (451). Therefore, the use of apéritifs to affect one's consumption of food was a practice in the 5th century. The apéritif was introduced in France in 1846 when a French chemist, Joseph Dubonnet, created his eponymous wine-based drink as a means of delivering malaria-fighting quinine. The medicine was a bitter brew, so he developed a formula of herbs and spices to mask quinine's sharp flavor, and it worked so well that the recipe has remained well-guarded ever since. French Foreign Legion soldiers made use of it in mosquito-infested Northern Africa. Joseph's wife was so fond of the drink that she had all her friends try it, and its popularity spread. Apéritifs were already widespread in the 19th century in Italy, where they were being served in fashionable cafés in Rome, Genoa, Florence, Milan, Turin, and Venice. Apéritifs became very popular in Europe in the late 19th century. The popularity in Europe crossed the Atlantic and by 1900, they were also commonly served in the United States. The apéritif recrossed the Atlantic in the 1970s: the habit of a substantial food offering with the purchase of a drink during "Happy Hour" in the United States pushed the development of a more food-heavy apéritif in Italy as well. In Spain and in some countries of Latin America, apéritifs have been a staple of tapas for centuries. In France, the apéritif varies from region to region : pastis is popular in the south of France, Calvados brandy in the Normandy region, Crémant d'Alsace in the eastern region. Champagne wine or Cognac may also be served. Kir, also called Blanc-cassis, is a common and very popular apéritif-cocktail made with a measure of crème de cassis (blackcurrant liqueur) topped up with white wine. The word Kir Royal is used when white wine is replaced with a Champagne wine. A simple glass of red wine, such as Beaujolais nouveau, can also be presented as an apéritif, accompanied by amuse-bouches. In Italy, vermouth or wine may be served as the apéritif (called aperitivo). Aperol spritz and Campari with soda are also popular aperitivo drinks of choice. In certain areas, it is not uncommon for a digestif to be taken before a main course. One example is le trou Normand, a glass of Calvados taken before the main course of a meal. ↑ Lichine, Alexis. Alexis Lichine's New Encyclopedia of Wines & Spirits (5th edition) (New York: Alfred A. Knopf, 1987), 75. ↑ Robinson, Jancis. The Oxford Companion to Wine (3rd edition) (Oxford University Press: 2006), 26. ↑ The Philokalia: Vol. 1; St. Diadochos of Photiki, On Spiritual Knowledge; p. 267. Faber and Faber, Inc. New York, New York; 1979. ↑ "The History of the Aperitivo". ↑ Brown & Miller, Jared & Anistatia (2011). The Mixellany Guide to Vermouth & Other Aperitifs. Mixellany Limited. p. 44. ISBN 978-1-907434-29-7. ↑ "Digestif". Dictionary.com Unabridged. Random House. Retrieved 6 March 2015. ↑ "pousse-café". Dictionary.com Unabridged. Random House. Retrieved 6 March 2015. ↑ Walton, Stuart; Miller, Norma (2002). Spirits & Liqueurs Cookbook. New York: Hermes House. pp. 16–17. ISBN 1-84309-498-3. 1 2 Ramchandani, V.A. ; Kwo, P.Y. ; Li, T-K. (2001). "Effect of Food and Food Composition on Alcohol Elimination Rates in Healthy Men and Women". Journal of Clinical Pharmacology. 41 (12): 1345–50. doi:10.1177/00912700122012814. PMID 11762562.